Plot: Product Description: Following a rescue mission to Mars, the survivor of a space expedition claims that his crew was hunted down and killed by an alien creature. Skeptical and believing that the survivor may have killed the crew in order to survive the rescue Captain misses the explanation. But soon the real truth and terror begins. Classic old-school black and white Sci-fi. This is what it's all about. 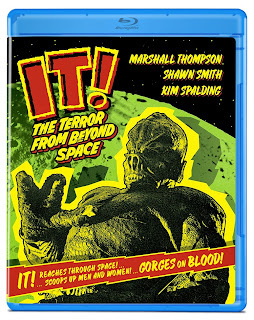 A perfect, and I mean perfect, Blu-Ray for this vintage Drive-in, terror. This is one of the greatest B-grade, 50's sci-fi, and now it's got perfection, in an outlet that it deserves. Olive Films did a beautiful crystal clear job, stunning in its black and white form. Equally stunning in the sound. This is a must own for fans of old B-grade, Drive-in sci-fi. I think one of the greatest realities to this this film is who is starring in it as the creature. The alien is played, by the one of a kind, and extraordinary, Ray "Crash" Corrigan. He was a perfect example of creating a creature, with his massive size, and height. He fit the creature in every way. He caused old school frights, and is truly a legendary creature in this space horror. All the hair raising mayhem. Spine tingling horror. A creature from the dark recesses of space. Olive Films, gives home to the classic sci-fi terror. Equal parts Drive-in flare, and equal parts midnight B-Grade horror. Simply put, a perfect example of retro-sci-fi. What can stop this unfathomable beast? Explosions, gas, electrocution, bullets. Humans must strive to destroy the monster that wants to crush them. Lovely transfer. Beautiful in its clarity. This is everything an old black and white should be honored, and graced with, an excellent product. Now it has to be mentioned, that this film was the inspiration and landmark to the idea of the 1979 Sci-fi classic, and in my viewpoint point, Sci-fi masterpiece, Alien. Dan O’Bannon who wrote the screenplay for Ridley Scott’s Alien, took the inspiration of, IT Terror from Beyond Space, and molded it into his story of an alien hunting the crew on a spaceship. So sci-fi and film lovers must respect, and pay homage to this old-school black and white sci-fi. A wonderful all-star cast. The one and only Marshall Thompson as Col. Edward Carruthers. Thompson had starred in one of my favorite sci-fi films in movie history, the same year, IT came out. He played the part of Major Cummings in the 1958 Sci-fi Drive-in Masterpiece Fiend without a Face. If you have not seen that movie, do so, it’s a must see. In IT he graces the cinema world as he always did, stardom and mastery. Started acting in 1944 and went on to act all the way up until his death in 1992. He was the golden ticket of acting perfection, old-school style, and B-grade perfection. Who can forget the beautiful stunning Shirley Jackson, as the character Ann Anderson? Shirley was in many films before IT, gracing cinema with her beauty and wonder of performing. Sadly after 1959, she no longer acted, but thankfully we have films such as IT to remember her beauty. Also starring the utterly amazing Ann Doran. She was a goddess of cinema. Her skill was perfection. In IT she plays the character of Mary Royce. She acted in a huge amount of cinema both small and great. A total of over 360 performances in her vast career. Starting in 1922, and worked all the way until 1988. A career that is unbelievable and utterly amazing in all its glory. She was in one of my Top 10 films of all time, Frank Capra’s 1938 Masterpiece of cinema, You Can’t Take it With You. She acted in many films in uncredited roles, and many short films, and television roles. No matter how small the part was, she gave the part what it needed. She worked alongside some of the legends of Hollywood, such as Boris Karloff, Cary Grant, Rosalind Russell, Gary Cooper, and James Dean. She never really got the stardom she deserved, but as long as there are films like IT to look back on, one can see the wonderment in her performances. Now I have mentioned this stars the wonderful Ray Corrigan as the creature. A true star if there ever was one. A pioneer in stunt man and creature acting. Often cast as a bad guy or creature in a suit. His size, and bulk, and ability to entertain through action, and frights is truly what the old and golden era of Drive-in cinema was all about. From B-grade westerns, to hokey late night sci-fi, and horror. He was the pivotal performer in so many greats. 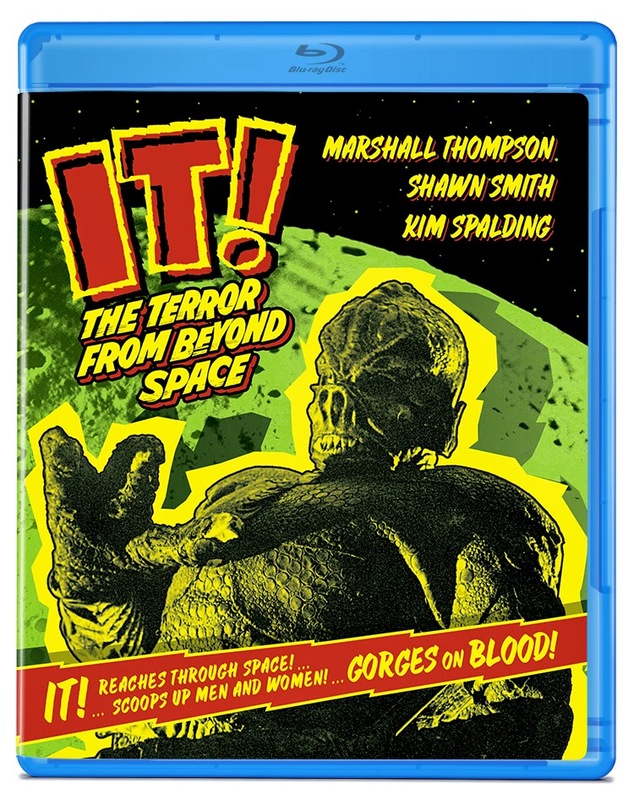 Started his career in 1932’s Tarzan the Ape Man as an ape, and worked to his last film, this one, I am reviewing, IT Terror from beyond Space. Starring in one of the great classic B-grade Serials of all time, 1936’s Undersea Kingdom as the main star of the film, simply know as Crash Corrigan. Constant stunt performer and actor in many upon many, westerns of the 30’s and 40’s. He was the B-movie star of so many pieces of cinema. Working his craft in many Ape suits, and alongside so many greats, such as Bela Lugosi. From 1932 to 1958 he graced the cinema world with action, adventure and terror. IT was his last film, and it was a perfect send off. He created the creature in all its late night Drive-in glory. Olive Films did a fantastic job in bringing this B-grade Sci-fi perfection to Blu-ray. This Blu-ray is perfection in both audio and video. It's never looked any better. Olive Films has paid respect to this old sci-fi gem. This is a must own, and must watch, Drive-in, Late Night perfection at its best. The wrap around art work for the Blu-ray case is amazing. Vibrant in color, the picture I have posted, does not do the art justice, the audio and video is crisp and clear, and looks like a modern film with its crystal clear clarity. I love this blu-ray, and highly recommended it. It will be released on May 19th 2015.